Being environmentally responsible means that every machine we produce has to consume less water and energy. We put our best minds at work to build and upgrade our machines to conserve our natural resources. We’ve infused groundbreaking technology into every machine we make, resulting in high-efficiency, environmentally responsible products. Having achieved “reduced water consumption”, Ramsons products also ensure reduced chemical consumption, steam consumption and ETP load. The Ramsons Vertostar ™ 7.0 series of front loading machines work at a ratio of 1:5 - 1:7 MLR, While older horizontal machines work at 1:10 - 1:12 MLR. The precise low gap between the outer drum and inner basket helps in saving water. The Ramsons Vertostar ™ 7.7 series comes equipped with a “Jet Spray System & “Filter Tank” which reduces the MLR to between 1:2 - 1:3. 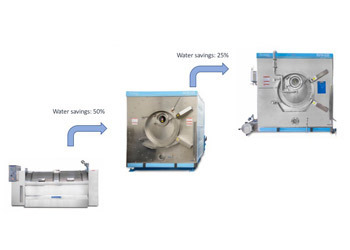 In one batch of a typical Washing process, 50% of the cycle is used for the RINSE process, where the water is easy to treat and can also be recycled or reused. Ramsons Vertostar™ series uses a state-of-the-art DUAL DRAINAGE SYSTEM that enables the reuse of effluent and can reduce the size of the ETP while reducing the overall cycle time. In addition to all of these steps in place to reduce the waste of process water, Ramsons also provides a rainwater collection design. Ramsons employs Nano Spray Technology in our efforts in sustainability to convert water and additives into a mist of nanoparticles. These nano water particles are then sprayed uniformly on garments, and this process saves up to 95% water. 60% of the chemicals used have zero discharge and no cost of effluent treatment. This system can be installed in any front loading Washing or Dyeing machine and works at a 1:0.6 to 1:0.9 MLR. This technology can be used for different applications like softening, resin, water repellant and wrinkle-free treatment. The Ozone processing is a variant of Green Production, as there is limited water and chemicals required. Further, as the process is conducted at room temperatures, the energy consumption is minimal. Since the Ozone destructor converts ozone back to oxygen, there is no harm being done to the environment. The highest consumption of energy in most laundries is in the form of steam. 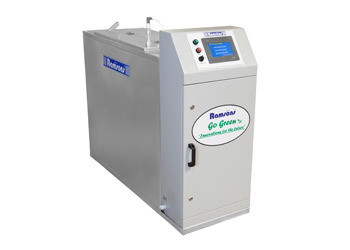 Ramsons has innovated the Conveyorized Dryer to reduce the cost of energy consumed. The yellowness on garments is removed as there is no over drying. 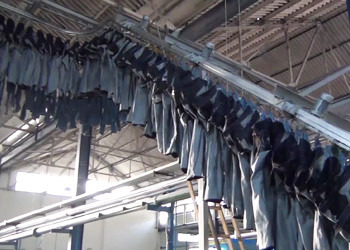 Manpower is reduced drastically as there is only need for a single operator to load and unload the garments. There is no additional space needed as the machine is assembled above existing machines. 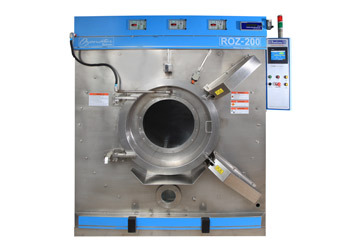 Automation in drying section by which you can enhance quality of garments along with reduction in Steam Consumption which will apparently help you to save on fuel.Most of the time our dryers are either running on time based or on temperature based. Which result 99% on over dried garments & loss of Steam. A recent trial installation has been done and working successfully we have been able to save 16% on Fuel Saving as of now. This system will work on Set parameters value as per your requirement. It can control HUMIDTY / TEMP / TIME under one software. It also helps you to check your Heat Loss in Pipeline. It helps to utilize condensate return properly to heat Boiler Feed Water tank as well as Generate Hot Water for plant requirement by saving Flash steam as well. 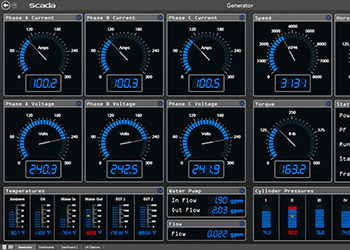 This system will allow you to gather proper data to analyze and control as per your requirement. 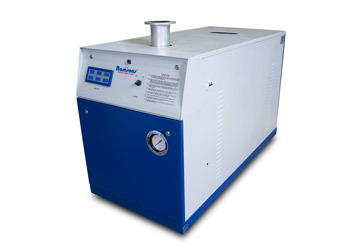 All Ramsons Diesel / Oil Steam Generators are IBR certified. A fully imported, European burner comes standard with these machines and ensures minimal consumption of fuel. Close to 90% efficiency ensures that operating costs are low. A small foot-print ensures that the boiler can be placed next to where the steam is needed.